Some might call the space eclectic, but we prefer well rounded - an adjective that describes the home's owners every bit as accurately as it does their inspired urban digs. The style, modern bohemian, if you need a label, is a youthful motif straight out of Domino magazine. Designer Kimberly Kowalski of Savvy Surrounding Style, owned by homeowner Chrissy Fogerty’s mother, has handled the entire Fogerty family’s décor, and offers, “They’re all different with their own unique personalities.” The pictures Fogerty approached Kowalski with for her Central West End condo were “all over the place,” Kowalski says, pointing to an unprecedented mix of periods, colors and textures. That’s what happens when you’re designing for a designer. Fogerty recently launched a line of vegan leather jackets that is every bit as chic and playful as her home. The entrepreneur’s trademark is unexpected synergy. “The black-and-white wall and patterned stools? That’s my favorite play right there,” says Fogerty. A piece of art in its own right, the geo design on the dining room wall was hand painted by a local pro, and serves as a focal point for the room, contrasting perfectly with those equally bold poufs. Aside from their visual appeal, the poufs, which double as seats, are space-savers, just like the unobtrusive floating shelves where the homeowners showcase accessories from trips abroad. “It’s always nice to get a few different looks, instead of going too far in one direction,” says Kowalski. The preexisting parquet floor got a modern lift from a grounding jute rug, Kowalski’s go-to “because it brings a natural element, creates texture without pattern and dresses things down,” she says. Industrial design spoke to Fogerty, so Kowalski paired metallic French school chairs with a grainy reclaimed-wood dining table, the latter a nod to homeowner Jon Keating’s affinity for simple, clean lines. 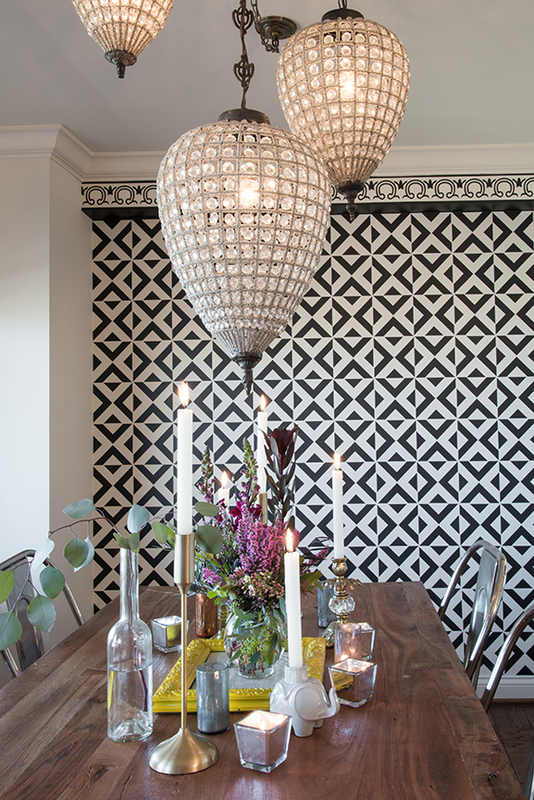 And then there is the Moroccan-looking chandelier — really three crystal lights from Eloquence grouped together by local electricians at Kalb Electric with a custom, matching plate. A flat-weave Native American runner and accompanying area rug add another layer, as well as a seamless transition from eating to lounging, picking up on the dining wall while making it seem that the space evolved over time, says Kowalski. 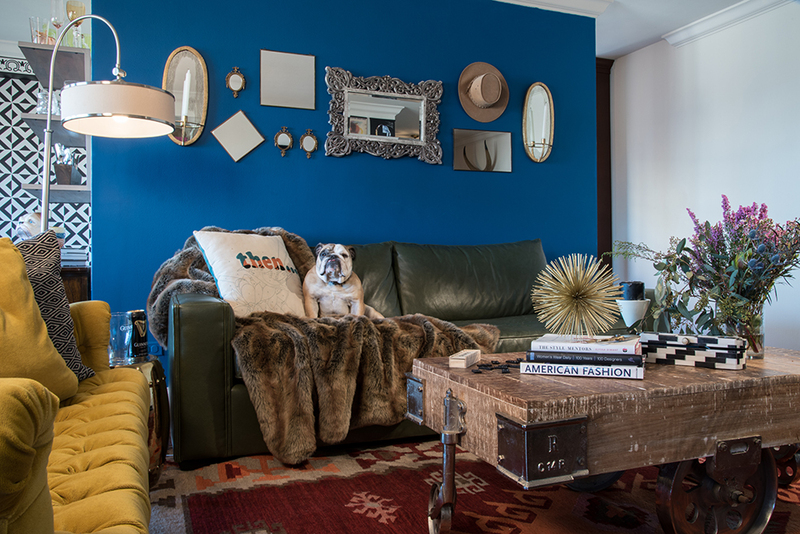 The intense, saturated peacock wall plays off the ‘60s throwback gold-velvet settee and neutral vegan leather sofa, both from Caracole Home. “A blue wall with green and yellow couches doesn’t really make sense, but it works,” Fogerty weighs in. Too much color, and you risk aimlessness. That is why Kowalski asked the homeowners to paint everything else – walls, ceilings, trim and doors – the same shade of white. “That makes the space look clean and modern, but it also keeps your eye from stopping,” Kowalski explains. 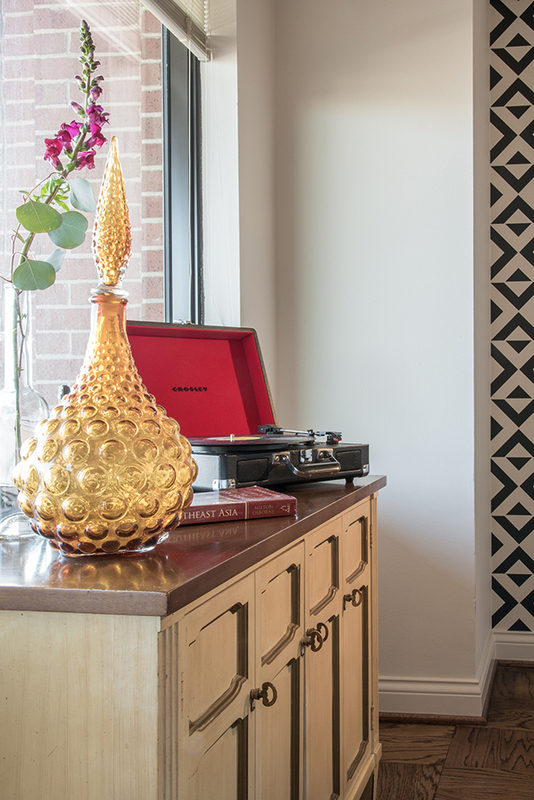 You would be better off having guests’ eyes hang on, say, a wall of sentimental album covers, which was installed by Fogerty using holders from CB2. “The cover art on records is so cool; it’s like this amazing wallpaper that you can customize,” Fogerty says. The gallery wall of mirrors is another one of her clever contributions, adding the illusion of square footage and increasing light. A mid-century floor lamp shines on the timeless, 1920s metal-and-bamboo-style bar cart that juxtaposes with a CDI International rolling furniture cart — another successful play. The best play of all, though, happens when the homeowners open up their high-rise patio doors on a balmy spring day and let the contemporary Central West End views wash over every decade of style.